Burlington, Ontario--(Newsfile Corp. - March 19, 2019) - CBLT Inc. (TSXV: CBLT) ("CBLT") is very pleased to announce it has closed on its previously announced purchase of a portfolio of Canadian mining assets (the "Assets") from GTA Financecorp Inc.("GTA") (formerly known as GTA Resources and Mining Inc.). See CBLT's press release of January 21, 2019 for details of the terms of the purchase. The Assets are all located in Canada and all have been explored to some degree. "There was much talk at PDAC2019 about the gold market moving higher this year," said Peter M. Clausi, CEO. "Commodities run through cycles. We are fortunate to be able to position CBLT to benefit should that gold move happen soon, and if it takes longer, the Assets can be maintained at relatively low cost until a better market develops. These are strong additions to CBLT's balance sheet." CBLT has no immediate intention to carry out field work on any of the Assets. See GTA's press release of June 10, 2014 and its subsequent other public disclosure for further details on Northshore's mineral resource estimate. In 2018 GTA carried out a diamond drill program at Northshore Gold and based on information from GTA CBLT disclosed the assay results from the program on February 26, 2019. CBLT believes this was a very successful program. The program included two long holes that expanded the Afric Gold Deposit, leaving it open for additional delineation at depth, particularly to the east and northeast. 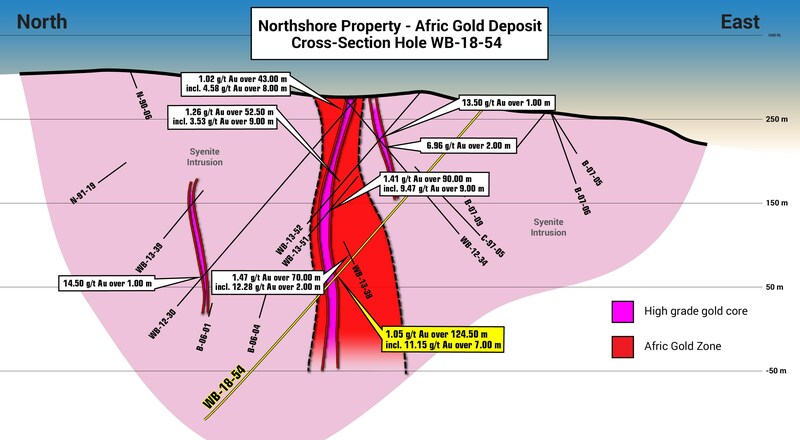 The Afric Gold Deposit demonstrated significant widths to depth highlighted by an intercept of 124.50 metres grading 1.05 g/t gold (0.86 g/t gold "cut") in hole WB-18-54. This broad mineralized envelope included a high-grade core, which returned 7.00 metres grading 11.15 g/t gold (7.65 g/t gold "cut"), including 1.00 metre grading 56.50 g/t gold. 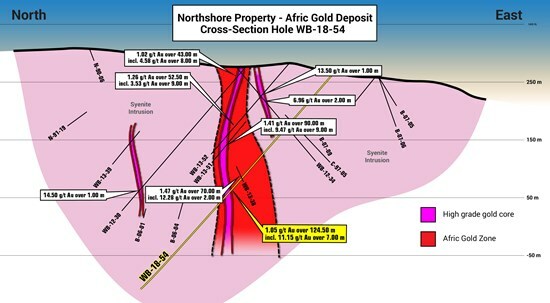 This intercept extended the high-grade core of the Afric Gold Deposit by approximately 125 vertical metres in the area tested, and may support a northeast plunge to the high grade gold mineralization. The sketch below provided by GTA shows the interpreted relationship between the deep hole WB-18-54, the high-grade core, and the mineralized envelope. Big Duck Lake is also in the Hemlo Gold Camp, roughly 25 km north of Northshore Gold. Strategically, it is 4 km west of the past-producing polymetallic Winston Lake Zinc Mine. The Winston Lake Zinc Mine produced 2.68 million tonnes of 12.05% zinc, 1.05% copper, 1.07 g/t gold and 31.37 g/t silver. The current optionee of the Winston Lake Zinc Mine recently released an updated resource estimate which estimates the remaining resource as .3 Mt, with 10.4% zinc, .7% copper, .88 g/t gold and 18 g/t silver (https://www.asx.com.au/asxpdf/20190307/pdf/4438rt0jptj9pp.pdf). Also included in the Assets are the Burnt Pond Property, a 28.5 sq km claim group on the Tally Pond volcanic belt in Newfoundland, within 10 km along strike of Teck Resources Limited's former producing copper-zinc mine at Duck Pond, and the Auden Property, a grassroots polymetallic property in northern Ontario, proximate to Zenyatta Ventures Ltd.'s Albany Graphite Project, which is a large high-purity graphite deposit. This news release contains certain statements that constitute forward-looking statements as they relate to CBLT and its management. Forward-looking statements are not historical facts but represent management's current expectation of future events, and can be identified by words such as "believe", "expects", "will", "intends", "plans", "projects", "anticipates", "estimates", "continues" and similar expressions. Although management believes that the expectations represented in such forward-looking statements are reasonable, there can be no assurance that they will prove to be correct. By their nature, forward-looking statements include assumptions and are subject to inherent risks and uncertainties that could cause actual future results, conditions, actions or events to differ materially from those in the forward-looking statements. If and when forward-looking statements are set out in this new release, CBLT will also set out the material risk factors or assumptions used to develop the forward-looking statements. Except as expressly required by applicable securities laws, CBLT assumes no obligation to update or revise any forward-looking statements. The future outcomes that relate to forward-looking statements may be influenced by many factors, including, but not limited to: reliance on key personnel; shareholder and regulatory approvals; risks of future legal proceedings; income tax matters; availability and terms of financing; distribution of securities; commodities pricing; effect of market interest rates on price of securities; and, potential dilution.